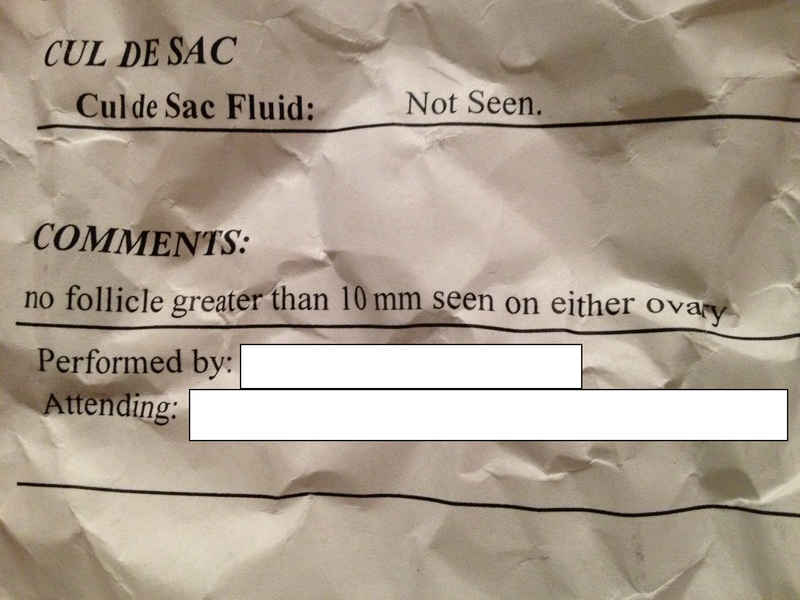 I had two good follies (thank goodness), one on each ovary. Righty had a 24 (show off) and Lefty had an 18. Both were perfectly round, healthy, looking great! 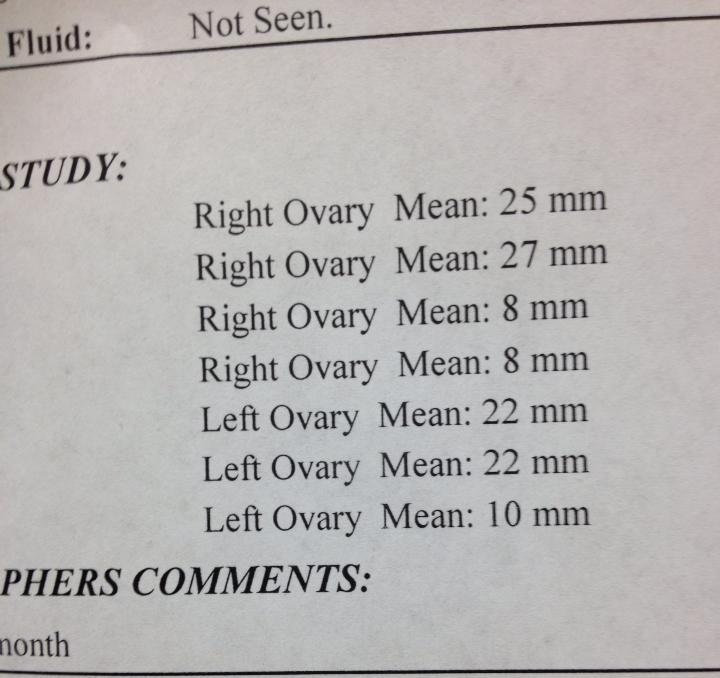 Of course, the tech had to comment that my ovaries also looked very busy… they were pretty overrun with tiny follicles all over the place and the scan took a lot longer today than usual, but she was being pretty thorough in her measuring and re-measuring. I like this tech a lot. 🙂 I had her last time and she was great! I think I have a significantly lower risk of OHSS this time (woohoo!) and ovulating should be a lot less painful. We triggered with an Ovidrel injection, so here we go! I am picking up a pineapple tonight so I can do that whole “eat the core for a sticky uterus” thing. 😉 We’ll see how that goes. I should ovulate tonight or tomorrow so I will start the regimen whenever I feel certain I am 1 DPO. Then progesterone somewhere between 3-5 DPO. Ovulating is half the battle, right? I’ve figured out a formula that works for me so we’re sticking to it. 100mg of Clomid with a trigger shot of Ovidrel seems to be my new BFF. However, getting my uterine lining to 8mm—which is the minimum it’s supposed to be for implantation—is a whole different ballgame. We’ve tried everything medicinal… high levels of estrogen, that didn’t work. Baby aspirin, that didn’t work. My doctor even tried doubling the estrogen and it gained me 1 extra mm… I haven’t been able to get above a 7, no matter what. I don’t know where all that stuff goes, but it’s not going to my uterus! It’s time to try some alternative methods. Last cycle, my uterine lining—while thin—was the healthiest it has looked this whole journey and I credit that to the red raspberry leaf tea I drank twice a day. I plan to do that again this cycle once “george” starts lightening up a bit, but I’ve been doing research (aren’t I always?) on other ways to help my lining without messing with my hormones. My main concern is I don’t want to do anything that could negatively impact my response to Clomid. I want that left alone. Red Raspberry Leaf Tea: CDs 5-13, drink 2-3 cups/day. I’ve written about this before, but its primary function is to “tone” your uterus. It does cause it to contract so it’s said that you don’t want to drink it during the second half of your cycle because it’s not 100% known if it will cause a miscarriage or negatively impact implantation. It’s best to drink it when your period is coming to an end and up until ovulation. However, I have also read that if you’re hemorrhaging (bleeding a LOT during your period) that this can help calm that down a bit and lesson your cramps, even though it’s technically causing contractions, somehow it’s better. I don’t know a lot about this… but I do know that when I was drinking it 2x/day, my uterus did feel worked by the 3rd day. It felt sore, but it wasn’t uncomfortable. This is also used to naturally induce labor once women hit 38 weeks and are concerned with having to deal with a medical induction. This has worked great for some women I know! I’ll write more about that some other day. Vitamin E: Daily, 600mg. This is one of those things I found out and thought, “duh, that makes sense.” What have we always been told Vitamin E does for us? It causes cell regeneration. It’s great for your hair, nails and skin. This makes perfect sense. In a study done back in 2010, 25 women were given 600mg of Vitamin E (the study fails to mention how many days) and 18 of them had significant change in their uterine lining. That is HUGE. Vitamin E is so simple, it won’t hurt to add this to my daily vitamin regimen. It’s good for my body in general and hopefully it will encourage my uterine cells to grow, grow, grow! B Vitamins: Daily. I already take a Vitamin B Complex every morning (Prenatal at night) and it gives me extra energy. It’s great for your metabolism, too. I’ve come across some information, although spotty, that says B vitamins are good for your uterine health, so I’m already on the right track. Plus, it gives me an extra 400mcg of Folic Acid (in addition to the 800mcg in my Prenatal) so I feel pretty good about that. Pomegranate Juice: CDs 1-13, drink 8oz/day. This is new to me! Apparently, 100% pomegranate juice is great for your uterus and some women claim that drinking it every single day helped their uterine lining significantly. I am behind on starting, but I plan to pick some up this weekend so I can begin. I think what I will do is make smoothies and use it as the base. Add in some berries (great antioxidants), spinach (rich in iron) and almond milk (great for protein). Those are just a few things. I’ve also read a little about fish oil, DHA, avocado (all those healthy fats). I’ll probably make a conscious effort to consume more of those things, but not sure if I will add more pills to my regimen. In addition, I probably need to cut back my caffeine (okay, I know I do, and I say this as I sip on an ice cold classic Coke) and I need to pick back up with more protein, less carbs and more dark leafy greens. I ate like that for a year and then got sick of everything I was eating. I wanted some macaroni and cheese, dang it! But truthfully, I need to do better in that department. PCOS means I cannot eat like crap because it affects me worse. Sometimes it is just so hard to be motivated. I also apparently need to keep my uterus warm, which means I need to stay nice and toasty, and that might be difficult with the cold weather upon us, but I will do my best. That’s it for now. Do you have any other suggestions for uterine lining improvement or for things that encourage implantation? What worked for you? ***UPDATE!!! I had success!! Read about it here: How to Naturally Thicken Your Uterine Lining – It Really Works! Had my beta drawn at 13dpo. It was less than 1 -AKA- negative. I’m not surprised in the least bit. My defenses went up when I got BFN after BFN the past few days… I finally just decided to quit testing because I just knew. I was out. And I was right. Once again, fail. Now to mentally prepare myself to have to do another very painful fertility treatment. I am so glad we have an answer now. Thankful for that. But it still hurts. Mentally, emotionally, physically… it hurts. So, we’ll know this week if we were successful this cycle or if we failed again. I’m not sure how I will take it if it’s not the outcome we’re hoping for. Around every corner, new people are pregnant. I’ve already shared how I feel about that so I’ll spare you the additional jealous complaining. I’m just so exhausted. Emotionally, physically, mentally. My body is worn out already. I’m gaining weight again from the fertility treatments and REFUSE to buy new pants even though I need them badly. I want to be able to invest in some new maternity pants. The thought of having to buy regular old pants right now makes me sick. I refuse to step on the scale, I don’t even have to. I’m back to where I was the cycle I got pregnant with Zoey, I can feel it, which isn’t bad, it’s not “overweight”, but due to the PCOS, I gain in my torso, which means people think I’m pregnant when I’m not. Thank goodness for stretchy leggings and cute boots, right? ‘Tis the season for trendy comfort. If we weren’t successful, I’m going to blame my uterus. I don’t know why I can’t get my lining where it should be. I am glad it was “healthy” this cycle, but it just wasn’t thick enough… I so desperately hope that if we were successful, that the progesterone is helping enough for a baby to survive. That’s all I got. I’m feeling very discouraged today. I guess it’s because I’m so used to failure, I sometimes just don’t know how to have hope. So… I had a P4. Those of you who understand P4s… I’m going to let you simmer on that one for a moment. I have no words. For those of you who don’t know, IT’S GOOD. I finally have a chance. 100mg of Clomid on days 3-7 was very good to me. I am so glad that I went with my instinct and decided to try it before going straight to Follistim. This cycle cost me $250 total (meds and ultrasound) whereas a Follistim cycle would have easily been $700-1,000 for the first round. 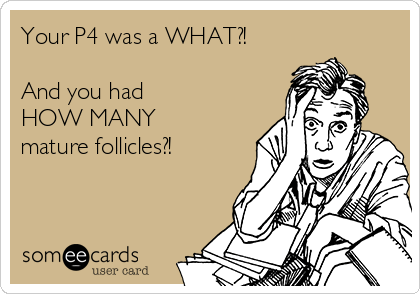 I had four good follicles! We triggered with Ovidrel so it’s time to officially TTC!! 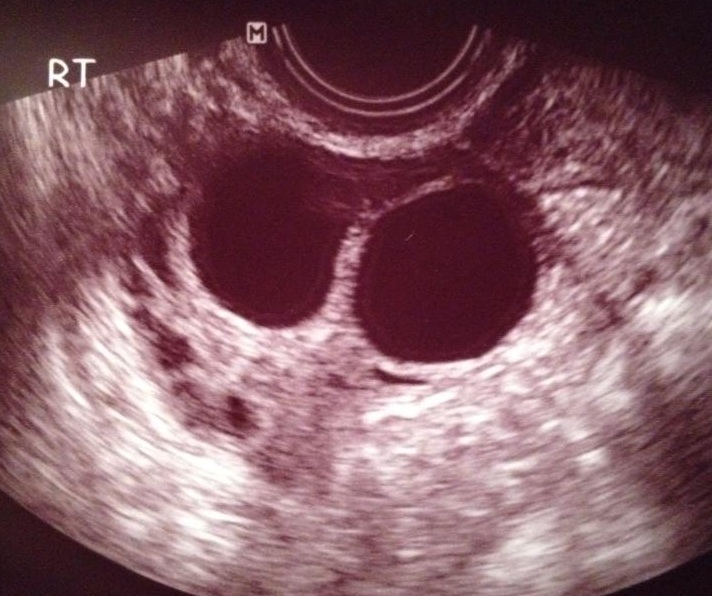 My endometrium has not gotten any thicker (it was only a 5), but it was shown as trilaminar, meaning it’s like an oreo cookie (three layers) and is great for implantation. I am going to credit the red raspberry leaf tea for that one because not once have I had a lining that looked this promising. I don’t know why I can’t get it any thicker, but I am going to just hope that the health of it will trump the thickness. Blog Spotlight: So, what happens in an injectable cycle anyway? A favorite blogger I’ve been following for a really long time now just recently posted a full explanation of what an injectible cycle looks like. 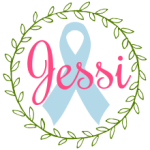 Let me preface this by saying that if you’re facing infertility of any kind, you need to subscribe to her blog. Out of everything she has been through (and it has been rough), she pushes through. It’s so inspiring. What Happens on an Injectable Cycle? Five days of Clomid? Try five side effects of crazy! 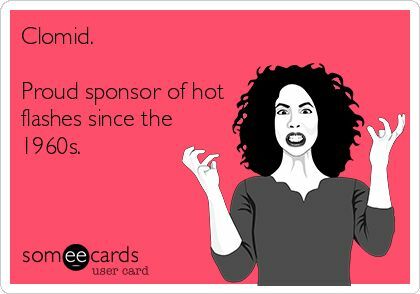 I am no stranger to Clomid. We used to be friends in 2009. I used it many times in our effort to bring Zoey into our lives. I hated it then, I hate it now, but it’s really a love/hate relationship. I love how I responded when TTC Zoey, especially since I responded better with each passing cycle, but I didn’t love how it made me feel. I think I am responding to this cycle already, based on the side effects I am experiencing, and that’s cool and all, but per the usual, I don’t love how it makes me feel. Hot Flashes. What else can make a 50-degree evening feel like you’re stuck in the Sahara Desert and give you the urge to stick your face in the freezer? CLOMID. Headaches. What else can take your typical seasonal headaches and turn them into migraines faster than you can eat a taco? CLOMID. Fatigue. What else can make you irritated at the sheer sound of someone’s breathing? CLOMID. Tiredness. 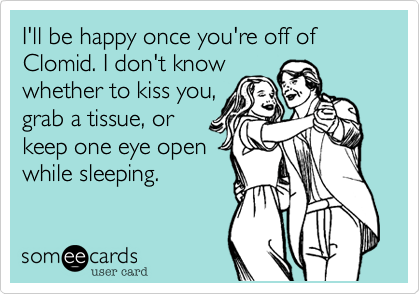 What else can make you feel like you’re a ZzZzZzZz…. CLOMID. Swollen Ovaries. What else can make your ovaries feel like a leprechaun snuck into your bedroom overnight and replaced them with someone’s fist? CLOMID. This cycle we are trying 100mg on days 3-7. I’m almost done. My follicle check is on Tuesday next week. I feel like this has to be working. All these side effects can’t be for nothing. There has to be something there, even if it’s just one follicle… a 15, a 16, anything better than what I have had so far this year with the Failure Femara. Even if it’s just one, I will take it. My fear is that my body is trying to mass produce again and that instead of getting one or two really great follicles, I’ll have a bunch of little minions all over and we’ll have to cancel. I’m just trying to take it one day at a time. Some days I feel very inspired and like this is going to be good and like I will conquer, and other days I feel like a complete and utter failure as a woman and like I just need to sit on the couch eating cookies and reading about cloth diapers all night. But one thing is constant – there is a mighty God so much bigger than PCOS and He will take care of this in His perfect timing. My timing stinks. His will be perfect. Someday it will all make sense, just like it did when we were finally blessed with Zoey. Right now? Yeah, it hurts. We can’t have a rainbow until after a good rain, right? This is what my cast of characters got me on CD 14. Yes, I crumpled it up as I walked out of the clinic. I have no words right now. 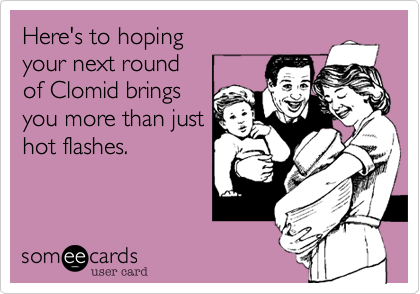 Going back to Clomid. Hoping 100mg does the trick. If not, my doctor wants to do Follistim. I’ll let you know how I really feel about that when I stop crying long enough to type it up.